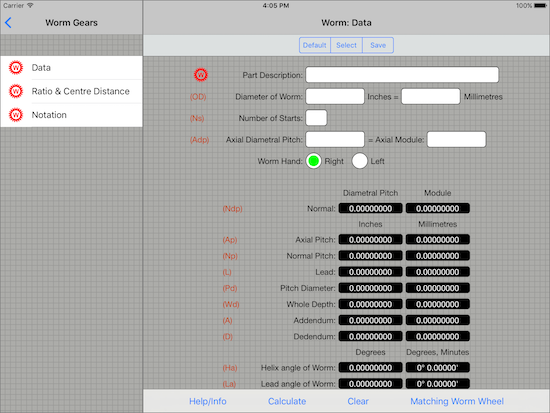 Gear Lab Pro is a collection of gear data calculators in the form of either an iPad or iPhone app that can be used with Worm gears, Helical gears and Spur gears. 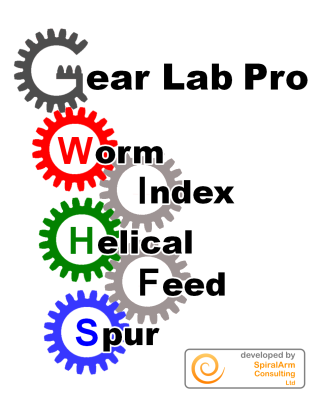 Gear Lab Pro has been developed by SpiralArm Consulting Limited and Gear Services (Letchworth) Limited to help in the manufacture of the Worm and Wheel gear sets, Spur gears, Pinions and Helical gears like the ones available via the Ultrascale web site. However, it can be used for the same type of gears from other sources. 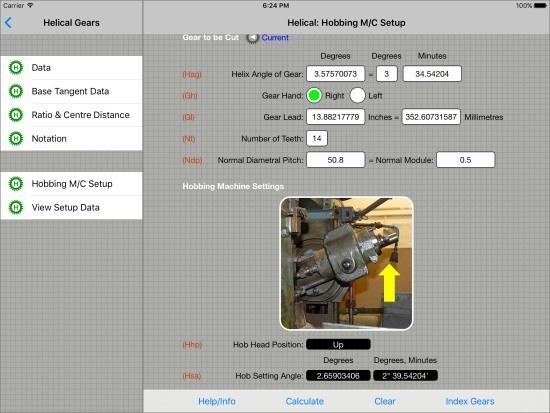 Gear Lab Pro is an extended version of the Gear Lab app and adds the calculators and information required for setting up a non-differential hobbing machine to cut both Helical and Spur gears. Those calculators can be used to workout the likes of the hob setting angle, index change gears and feed change gears required. The calculators have been developed to help in the Setting up, Production and Checking of the gears like the ones available via the Ultrascale web site. Three of the main types of gears are covered, these are Worm gears, Helical gears, and Spur gears. The flow of the app has been setup in such a way as to allow for the calculators to be used on a individual basis, using the minimal of information to output the basic data required, or as a complete process flow from start to finish. For example , starting at the worm then creating a matching worm wheel and then to output the base tangent data to allow the gear to be checked. 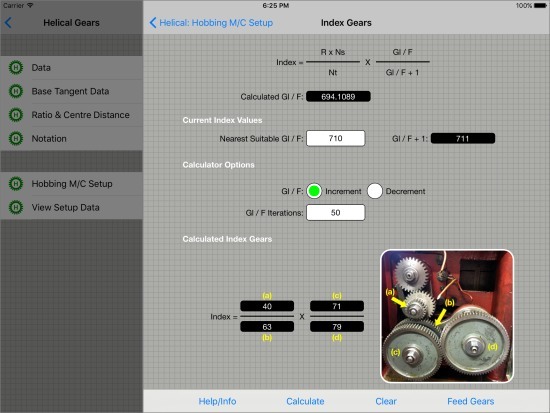 This version of the app extends these calculators to include the setting up of a non-differential Hobbing machine. In our case a Pfauter RS00. However, there is no reason these calculators could not be used with other hobbing machines. The hobbing machine calculators are a three stage process. First, data is input about the Hobbing Machine, Hob and Gear to be Cut. This stage also outputs the hob head position and hob setting angle. Second, the Index change gears are calculated using data from the first stage. Third, the Feed change gears are calculated using data from both the first and second stages. The setup data from all three stages can then be saved and viewed later from within the app. The calculations are based on the gear systems Diametral Pitch and Module and assume that you are using standard full depth-teeth. 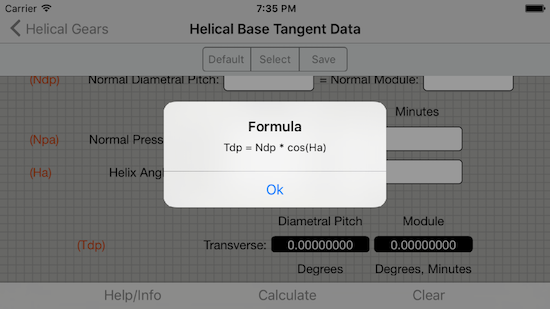 When calculating the base tangent data, the profile shift coefficient has been fixed at 0 (zero) in order to simplifiy the calculations, However, this does mean that no allowance can be made for corrected gears. It should be noted that the Metric/Module results that are displayed by the calculators are converted from the Imperial/Diametral Pitch calculations and as a result, there could be some slight variation due to the conversion from Imperial to Metric. However, this should not effect the overall results to any significant degree and therefore should not cause any problems when using the metric results. The number of decimal places in the gear data calculators can be changed from 3 to 8. However, the calculators used for the hobbling machine data are fixed to 8 decimal places. 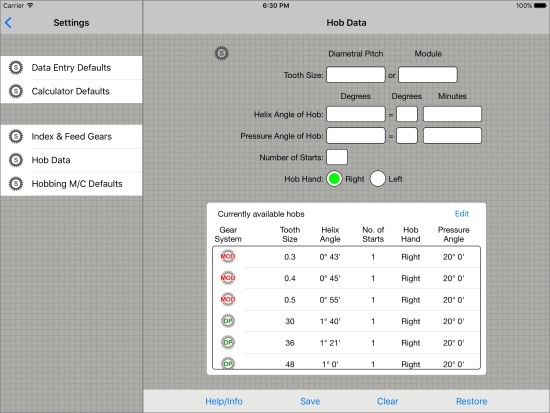 The first version of the app will be a free version, with the restriction that you will only be able to save a total of 5 hobbing machine setups per mobile device. If you wish to save a new setup you must first delete at least one of the currently saved setups. However, the limit does not stop you from doing the calculations, only saving them. In future versions of the app we will be looking at adding cloud storage and sharing saved calculations between devices. The calculators in this app have been tested and no errors have been found, However, no warranty is given or implied for the correctness of the results from the use of these calculators. Therefore, use of these calculators are at your own risk. 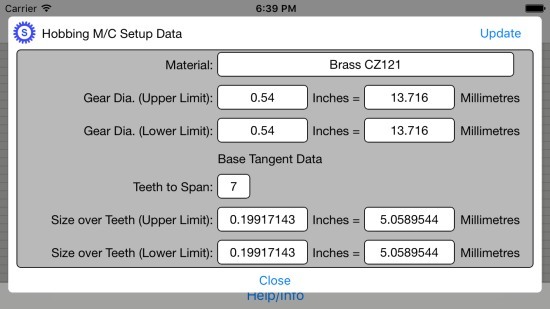 Here you enter the required gear data for the calculations. Some fields are automatically filled when entering data, for example the Diametral Pitch and Module, you can enter either as the other will be automatically converted from whatever is entered. Here the calculated results are displayed after clicking the 'Calculate' option on the bottom toolbar. The results were applicable are displayed in both Imperial and Metric units. The top button bar as three options. 'Default' - This loads the input data fields with the data preset in the 'Data Entry Defaults' section of the app., 'Select' - This displays a list of input data saved using the 'Save' option. This input data can then be loaded into the input data fields by clicking on it, 'Save' - This saves the currently displayed input data for later use, by using the 'Select' option. The bottom toolbar has a number of options depending on the calculator in use at the time. But all calculators have the same basic options. 'Help/Info' - This displays the help for the calculator, 'Calculate' - This calculates and displays the results based on the data entered, 'Clear' - This clears both input and output data from the calculator ready for the next calculation. The formulas used in the calculations can be displayed by clicking on the letters in the brackets on the left hand side of the screen. This displays a pop-up dialog showing the formula used for that result etc. It should be noted that not all the letters in brackets have a related formula and clicking on them will have no effect. Each of the main gear sections Worm Gears, Helical Gears and Spur Gears has notation information. Here you will find diagrams outlining the notation used in the calculators in each section along with the notation used in the formulas, It should be noted that the notation used in these calculators for the formulas and the diagrams is non-standard and was created specially for this app to try and make them easier to remember and understand. This is the first stage of a three stage calculator used to setup a non-differential hobbing machine. Both Helical and Spur gears can be produced using this calculator. This stage of the calculator has the following sections. The information input and the data output will depend on whether the gear to be cut is a Helical or a Spur and any calculated results will be displayed in both Imperial and Metric units were applicable. On sections 1, 2 & 3 the relevant fields for each section can be autofilled by clicking on 'Default', 'Select' or 'Current' or the required details can be entered manually. 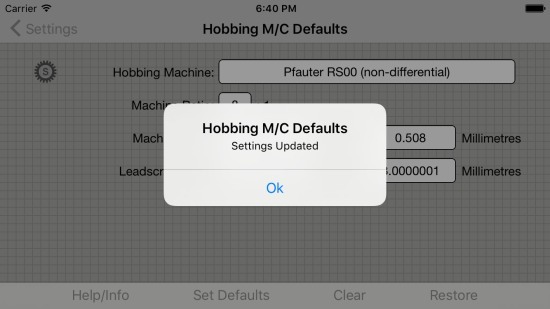 Clicking on 'Default' will autofill the 'Hobbing Machine Details' section with the data that is stored in the 'Hobbing M/C Defaults'. It will also autofill the 'Hobbing Machine' field. Clicking on 'Select' will autofill the 'Hob Details' section with any of the hobs your select from the ones stored in 'Hob Data'. Clicking on 'Current' will autofill the 'Gear to be Cut' section with the data, if any, that is currently available in the 'Data' section for the gear type to be cut. It will also autofill the 'Part Description' field. This is the second stage of a three stage calculator used to setup a non-differential hobbing machine. Both Helical and Spur gears can be produced using this calculator. This stage of the calculator has the following sections. 1. Formulas, Notation and Values for Index Gears. The information input and the data output will depend on whether the gear to be cut is a Helical or a Spur and any calculated results will be displayed in both Imperial and Metric units were applicable. Data fields with white text on a gray background show data from a previous stage. Data fields with white text on a black background show data calculated in the current stage. and data fields with black text on a white background show data calculated in the current stage and also allow user input to change this data if required. This is the third stage of a three stage calculator used to setup a non-differential hobbing machine. Both Helical and Spur gears can be produced using this calculator. This stage of the calculator has the following sections. 1. Formulas, Notation and Values for Feed Gears. The bottom toolbars have a number of options depending on the calculator stage in use. But all calculators have the same basic options. 'Help/Info' - This displays the help for the calculator, 'Calculate' - This calculates and displays the results for that stage, 'Clear' - This clears both input and output data from the current calculator. as well as deleting any setups that are no longer required. On the 'Gear to be Cut' section some of the fields can be autofilled by clicking on 'Calculate' or the required details can be entered manually. Clicking on 'Calculate' will autofill the following fields with data calculated from the information in the hobbing machine setup data. The calculated data can then be modified to give a upper and lower limit for the gear to be cut. Once any changes have been made click 'Update' to save any changes. The bottom toolbar has one option. 'Help/Info' - This displays the help for the 'View Setup Data'. 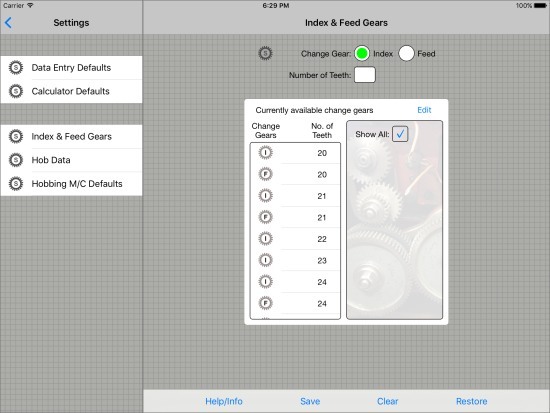 Here you can enter and store details of any Index or Feed change gears that you may require for the 'change gear' calculations. 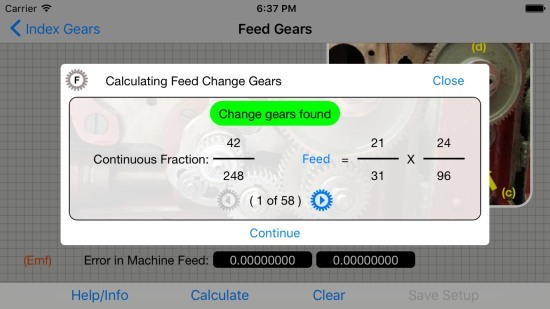 These details will then be automatically used when calculating the Index and Feed change gears. By default the app has preloaded a selection of Index and Feed change gears. The preloaded Index and Feed change gears are not a complete set, but are the ones we have for our hobber and as yet we have not had any problems finding change gears for any gear we have had to cut. All the preloaded details can be changed as required. Here you can enter and store details about any hob that you may require for the 'change gear' calculations. You can then either select from this list of hobs, from within the 'change gear' calculator or you can manually enter other hob details from inside the calculator. By default the app has preloaded a selection of common tooth size hobs. Here you set the required details about the hobbing machine that the 'change gear' calculations require. Or you can leave them blank and enter the required data from inside the calculator. By default the app has preloaded a set of hobbing machine details. 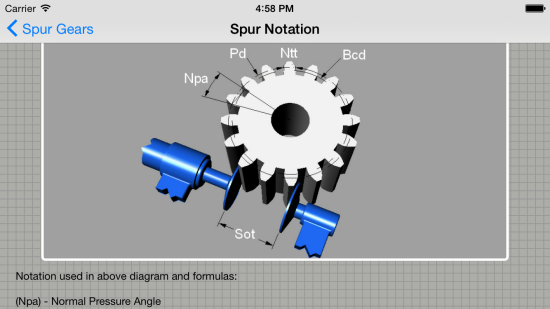 This calculator is in the form of either a iPad or iPhone app that can be used to calculate the Outside Diameter, Centre Distance and Ratio of spur gears and pinions. 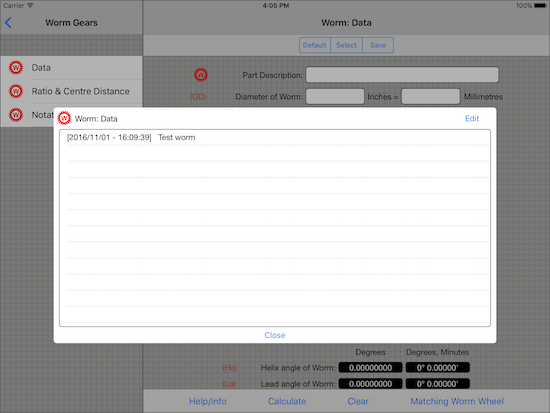 Gear Lab is a collection of gear data calculators in the form of either a iPad or iPhone app that can be used with Worm gears, Helical gears and Spur gears. This calculator is in the form of either a Tablet or Phone app that can be used to calculate the Outside Diameter, Centre Distance and Ratio of spur gears and pinions. If you require any further help or information with the use of this app or have any questions about it. Please let us know. Our details can be found on the 'Contact Us' page of this web site.